DUSHANBE (Tajik Air press service/Asia-Plus) — Tajik national air carrier, Tajik Air, is launching a new air route — from Dushanbe to the Uzbek city of Samarqand. The first flight on this air route is expected to be operated on July 28. Boeing 737-300 will be used to operate this flight. The next Dushanbe-Samarqand flight is scheduled for August 4. A ticket for the Dushanbe-Samarqand flight reportedly costs 684 somoni. For its part, Uzbekistan Airways has operated the regular flights from Tashkent to Dushanbe since April this year. The first flight was operated on April 11. It was the first regular flight between Tashkent and Dushanbe since 1992. With the exception of a test flight on February 10, there had been no direct civilian flights between the two capitals since 1992. Uzbekistan’s national air carrier now operates once-weekly service from Tashkent to Dushanbe on Tuesdays. A ticket for this flight costs 910 somoni and a round trip ticket for the Tashkent-Dushanbe flight costs 1,585 somoni. Until 2008, Tajik Air had an absolute monopoly in Tajikistan’s air transport, owning all planes, airports, and airport and flight services. 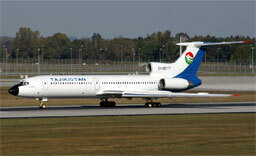 As a result of restructuring, Tajik Air was split up into several separate companies. Tajik Air currently serves the following destinations: China (Urumqi); India (New Delhi); Iran (Tehran, Mashhad); Kazakhstan (Almaty); Kyrgyzstan (Bishkek); Russia (Moscow, Novosibirsk, St Petersburg, and Surgut); and Tajikistan (Khorog and Khujand).